In search for the best cup of tea, we have to devote much attention to the quality of the water we use. Water makes 99% of the tea and bad water easily spoils the best teas. So Teaparker devoted yet another lesson to water last week. Let's first recall Lu Yu's findings dating back from the Tang dynasty. He found out that the best water comes the mountain sources. Then comes river water in valleys, where the river is neither too quick nor too slow. And worst are most underground waters from wells. Water at the bottom of a cascade is also very bad, because it is too agitated, sour. By the way, Lu Yu also said that silver and gold boilers are best to cook the water. 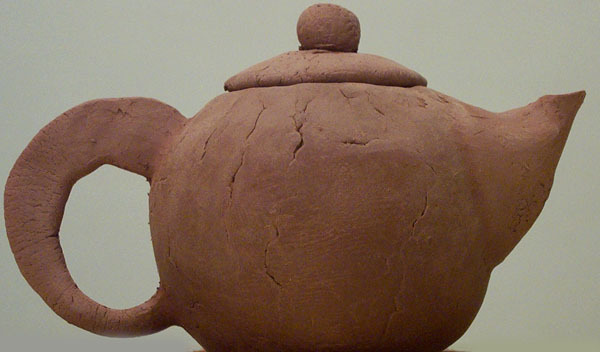 Teaparker gave us the opportunity to prove this point with a 99.9% silver pot. It's very hot and very expensive too! The water bubbles remain very small and the water is very 'delicate'. But I reckon that using my Japanese tetsubin will be sufficient until the Taiwanese ETF (Exchange Traded Fund) I own skyrockets. Of more practical use is this other teaching from Lu Yu: "The water that is from the same region as the tea will be its best fit." It makes sense. The tea leaves will perform best when they are hydrated with the same water that used to nourish them. This explains, among other things, why the tea you drink in the producing region tastes much better than back home. (One time travellers to China should beware! My advice: bring some tea from home so that you can evaluate the change in taste). 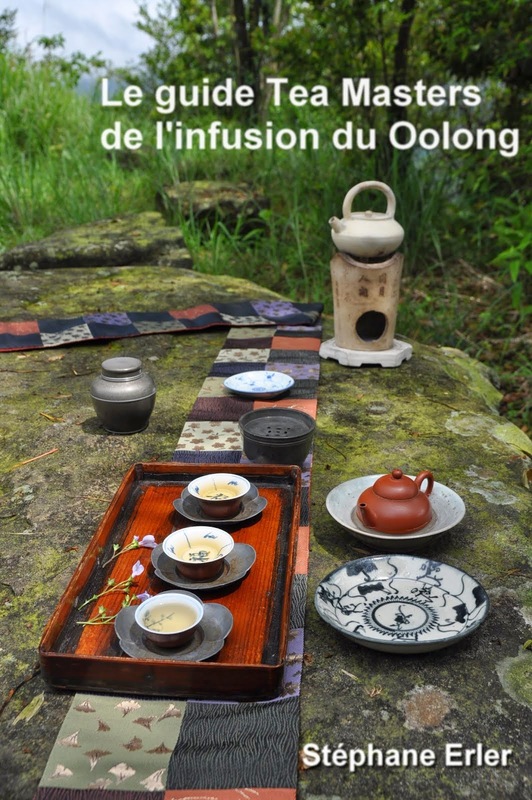 Now, does it mean tea vendors in Asia should start selling local Yunnan, Lugu, Pinlin water with their pu-er, oolong and baozhong? Probably not. This would seriously undermine the logistical cost advantage tea has over other beverages like wine. b. give it a 'Chinese touch' so that it fits better with Chinese tea. Any idea? Soy sauce!? It would definitely make the water taste more 'Chinese', but I doubt it would taste good with tea! No, the solution I thought of is to use activated bamboo charcoal. Teaparker agreed with me that bamboo charcoal treated water tastes better than ordinary water. He only had a word of caution: use a mineral poor water water as a base and don't let the charcoal add too many minerals to the water, otherwise the water may get too hard. My theory is that bamboo is THE quintessential Chinese plant. It should be perfect to reach our two goals of improving the water quality and giving it a 'Chinese' taste. The use of charcoal bamboo as a water purifier seems quite solid. The fact that it's supposed to emit negative ions reminds me of the nano water machine Teaparker is fond of lately for his water. (I am not a fan of miracle-like claims of a particular substance, by the way. I think it is very hard to verify medical claims, but when it comes to taste I just need my tongue to form a judgement). Taiwan's bamboo mountain is located somewhere between Dong Ding and Shan Lin-Shi, the main oolong producing areas of Taiwan. Bamboo therefore grows in pretty much the same conditions as Taiwan oolong. The minerals it releases must probably be in a very similar proportion as the soil and water there. And what else than bamboo to represent Chinese character?! So I ordered some charcoal last week. It arrived on Thursday and I have done some experimenting with it. My home has one of the worst tap water I ever encountered. I will even taste it's bad smell sometimes in the soup! I let two pieces of charcoal in 600 cl of cold tap water for 8 hours. The result was astonishing: the filtering properties are clearly working and the taste is greatly improved. I evaluate that the bad stuff (chlorine, others) have been reduced by 80% in intensity and that a smooth texture was added. For making tea it's still not good enough, but at least I am convinced it works. I'll try to leave the charcoal longer next time. The plastic bottle smell almost completely disappeared and I feel a little tickling on the tip of my tongue, like the 'soda' effect I detected in the nano water from Teaparker. The addition of minerals also makes it more smooth and refreshing. In my opinion, this means the pure water has come alive again. It's not as cold as Evian and I think it will be good for my tea. Boiling the water is supposed to accelerate the exchanges between the charcoal and the water. However, I found that the plastic smell didn't disappear as much as above. 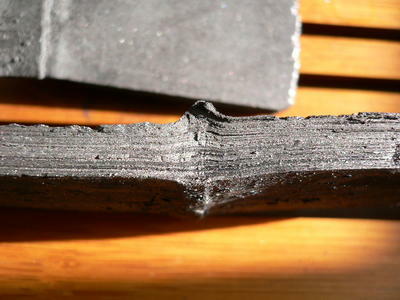 The boiling time should be kept to a minimum to avoid that the water turns old (in theory, when not using charcoal), so the charcoal may not have had enough time to do its job. I will try to see what happens if I wait longer at a higher temperature. Preliminary results seem to validate my theory. Best would be to perform the tests on water in the USA and in Europe. 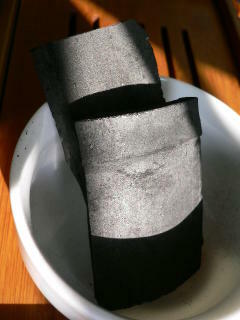 To do this, I will give 2 pieces of FREE BAMBOO CHARCOAL SAMPLES to those of you interested in sharing their results, with each order of tea or accessory, as long as my supply lasts. Hi I am wondering if you are still making bamboo charcoal available. I live in Los Angeles and would like to filter mountain spring water and also my reverse-osmosis filtered water and compare it to plain spring and reverse-osmosis filtered water while brewing tie guan yin. How would I order it (I'm still learning my way around these blogs). Please send me an e-mail at: stephane_erler@yahoo.com and I'll give you all the info you need. I can attest that this stuff really does improve the quality of the water, and the tea with it. 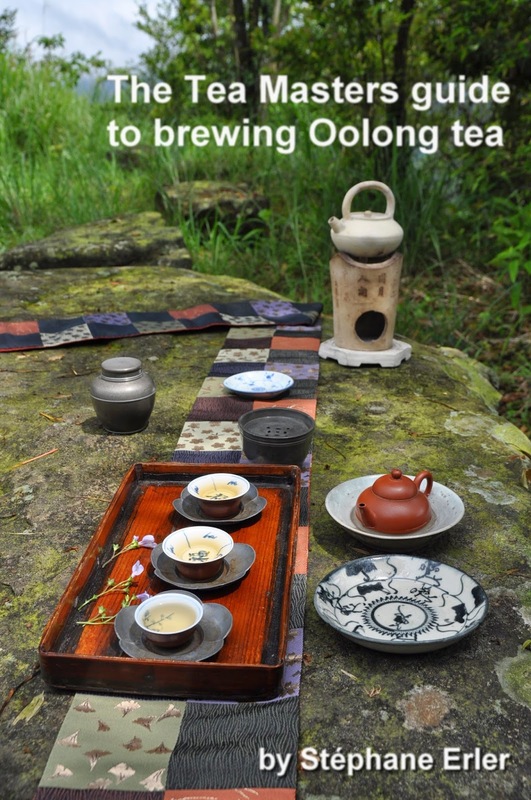 Many different teas I prepared seemed much more alive and vibrant in my mouth. The mouthfeel and the 'chaqi' are both noticibly enhanced. My testing wasn't rigorous, but I found putting several pieces in my kettle worked better than placing them in the water bottle overnight. I look forward to experimenting further. THERE IS SOMETHING called mai fan si, which are basically mineral stones, to add minerals to the water. I like your charcoal idea, i wonder if bamboo is the best wood to use for this use. Speaking of minerals, you could also put a piece of broken Yixing teapot in the water boiler. The important thing is that the minerals added be compatible with tea. I don't know about the ones you recommend, but with Yixing clay or bamboo charcoal, we are using materials that are found in Chinese tea areas. Yixing has tea plantations. And bamboo can be seen around San lin Shi plantations. I'm sure you find bamboo where most of Chinese teas grow. This makes it a good charcoal, because it's minerals composition is close to that of the soil that produces tea. How about sharing simple recipes? I have been seeking a recipe for Korean rice balls for some time now - can you help? Can't help with Korean rice ball recipes. Sorry! I tried leaving two pieces of charcoal in a pitcher of water for 24 hours. I then brewed the same tea (Da Yu Ling Luanze Oolong from here), with charcoal water, and the regular water I use for tea. The tea made with charcoal water was definitely better. The tea was sweeter and felt better in my mouth. It's probably not something I will use that often, but the charcoal makes a noticeable difference. You can get it from me. Send me an email at: stephane_erler at yahoo dot com and I'll send you my price list. First, a big thank you to Stephane for providing samples of this wonderful tea tool in his tea shipments. Using the bamboo charcoal has truly opened our eyes (or should I say taste buds) to the importance of good water when brewing tea. Recently our municipality decided to increase the amount of chloryne in the water it distributes. Even filtering with a Britta filter did not completely eliminate the chemical odor/flavor. Enter the Teamaster's charcoal! Following Stephane's instruction, the bamboo samples were activate and tea brewing water has not been the same in our house since. In terms of usage, we have been soaking two pieces of activated charcoal in a two liter glass pitcher for about 10 and 12 hours at room temperature. The result is a water that is much softer (almost sweet?) with no trace of chloryne. We have yet to experiment with different soaking times and temperatures but that may be for. Overall this simple product has opened a new realm of possibilities in terms of fragrances and flavor! Hats off to the Teamasters =D! This is interesting. Charcoal is a material that has been burned in an oxygen free environment to eliminate the water and other organic compounds in the cellulose structure... if I remember correctly! Therefore, I'm not sure that the type of charcoal will make much difference - but hopefully I'll get to place an order with you and therefore get to test the difference between charcoal and a brita filter that also uses activated charcoal. Scottish Water today welcomes the report by the Drinking Water Quality Regulator (DWQR) which confirms that the overall quality of drinking water in Scotland has continued to improve. I finally got around to experimenting with the charcoal bamboo you sent. Half a piece dropped into a medium-sized Brita pitcher fed with PUR filtered water and left to sit for 6-12 hours seems to add some notable life back into the water. It tasted crisper, sweeter, more dynamic and, well, more like water. Thanks for the opportunity to try them out. Victorvalley Subarbanite Filtered Water in California Transformed by Bamboo Charcoal.